"An amazing story told with steep honesty. 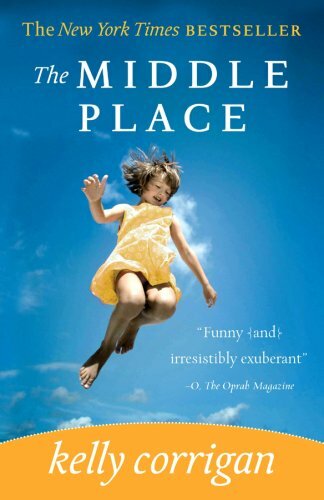 The Middle Place is memoir at its highest form." "If you're in a book club or just love to read, make sure this book ends up in your lap, where it will remain until you finish. Plan to laugh, cry, and be consumed by Kelly Corrigan." "Bravely reveals the frightened daughter inside the grown-up wife and mother." "Come for the writing, stay for the drama. Or vice-versa. Either way, you won't regret it." As a mother and a cancer survivor I could relate to so many of the emotions Kelly Corrigan skillfully expresses in this memoir. I was amazed at her candor, I don't know if I could have been as open about some aspects of my past as she is. But she holds nothing back from the reader. And as a result this book is completely engrossing. If you read it, be prepared to be consumed by it. Oh, and I guarantee you'll fall in love with Kelly's dad, George ("Greenie") Corrigan like I did. I did not like Kelly! I'm not sure Kelly Corrigan even thinks cancer is yucky. I'm not sure what she thinks other than she is the centre of the universe and other people better know it. 5 stars?are you kidding me? Kelly Corrigan has penned a poigant memoir describing those 30-something years when you've a young family of your own, but feel deeply connected to your family of origin, still. Readers will giggle over the exuberance of the author's Dad, "Greenie." Any girl who adores her dad will relate to this story. The structure of the book, alternating chapters between childhood remembrances and cancer treatments, works well. The topic could well be maudlin, but Corrigan's humor tempers the description of coping with cancer. Kelly Corrigan has a humorous approach to her writting. Found the transition from present to past interesting. Wasn't sure how losing her virginity had a thing to do with her journey. Actually found it a little disappointing. Wanted to give it to my daughter to read but changed my mind. How do you rate someones life? The title should have been - "Me Me Me"
I enjoyed getting to know Kelly Corrigan and I laughed and cried throughout the book at her wit and honesty. I loved learning about her "larger than life" Dad, aka "Greenie" and the special father-daughter relationship they share. Her candid point of view and humor kept me reading and wanting more - I look forward to her next book! Book was self indulgent and mediocre at best. I read all the reviews posted in and on the book itself and thought it would be a great read. It was not. It was just ok. I would not recommend it. Some parts were somewhat funny, but I've read far more funnier, wittier books, well written books that tugged at your heart stings. Try "Friday Night Knitting Club by Kate Jacobs,(novel)" and "Running with Scissors by Augustin Burroughs (memoir)"
Great book! Share it with your friends! Alternately funny and poignant, I found this to be a delightful read. It made me want to hug my kids and my parents and live a more joyful life. Kelly Corrigan has written a very encouraging, fast read. It will make you laugh, make you cry. I can relate to her "middle place". Kelly Corrigan grew up quite the "Daddy's Girl." Her father, George, is one of those characters who everyone loves - the kind of person who never meets a stranger. In 2004, Kelly was a happily married mother of two, comfortable in the middle place - "that sliver of time when childhood and parenthood overlap." While playing with her daughters one evening, Kelly discovered a lump in her breast that turned out to be cancer. While she was undergoing cancer treatments, her father found out that he had bladder cancer. As Tolstoy once said. It's the unhappy ones that are truly interesting. As a child of one of the "other" types of Irish Catholic families -- the ones you usually hear about with drinking and violence and generations-old seething, stewing feuds and lets not forget the unwanted pregnancies -- I personally found it hard to believe that everybody could be so damned happy! There, I've said it. I found it even harder to believe that Ayelet Waldman is quoted on the back as saying she loved the book, since her own writing is so much darker, biting and edgy. I sensed throughout that the author was being disingenous, that she kind of covered up anything that made her uncomfortable and didn't REALLY share anything. For example, she hints at this whole ongoing drama about how she wants to move back to Philadelphia to be with her family, and her husband finally sits her down and says, "we're your family now, and home is where we are" meaning the husband and children. You've gotta wonder if his take on the whole situation, where she forces her brother to find a job for her husband in Philadelphia and then badgers him to go on the whole job interview, and then it falls through, is anything like hers. Also, every Irish catholic family I know was so damned repressed that there's no way in heck anybody's DAD was ever going to be there for someone with BREAST cancer, given that that might involve actually having to say the word "breast." My dad would probably use some euphemism like "your health issues" and stay about as far away as he possible could. She kind of tells these little stories throughout, for example, about how she was travelling in Australia, and while she was gone, four relatives including her dad had cancer, but no one told her because they didn't want to upset her. But she glosses over it, like it's nothing. She never REALLY tells the interesting stories. Now that would have been a good book. In an era of memoir publishing that seems to have become an ongoing contest of who can claim the most horrific childhood, The Middle Place by Kelly Corrigan is strikingly different. She had an enviably normal childhood with a doting father, a somewhat stern mother and two lacrosse-crazed, good-natured brothers. But in the middle place in life, where she is both a child who still needed her parents for guidance and yet also a young mother herself, Kelly Corrigan is diagnosed with breast cancer. Written in chapters that alternate the story line of Corrigan's year with cancer with chapters of traditional memoir, we come to know who she is and why she so loves both her families--the one she came from and the one she makes with her husband and children--as she relies on them both through the medical nightmare of fighting cancer. In her weaving of the story of her childhood and young adulthood with her more recent year of illness and recovery, Corrigan makes it easy for the reader to fall in love with the characters in her life. Central among them is her father, George Corrigan, who not only goes by the nicknames "Greenie" or "Green Man," he also gives a nickname to most everyone he knows. His only daughter he calls "Lovey," never denying that she holds the sweetest spot in his heart. The favorite dad in the neighborhood, Corrigan always went to her dad for permission, knowing he was the easier target. Once, after he told her she could go to a party where there was beer, he showed up an hour later telling her he was there to bring her home because her mother couldn't sleep until he did. Months after Corrigan's discovery of her breast tumor Greenie himself is diagnosed with bladder cancer (something revealed on the book jacket). Corrigan then begins to take care of her father in the only way she can while living on the other side of the country and undergoing her own cancer treatment--she becomes and expert on bladder cancer and navigates her father to the foremost oncologist specializing in that area. In the process of literally fighting for not only her own life but also her father's, she truly becomes an adult. This book is the true story of Kelly Corrigan, who is having a nice life until she finds out she has breast cancer. if that is not bad enough, later on she finds out her dad has cancer. Thus she is caught in trying to battle cancer and deal with her husband and kids while wanting to be there for her dad too. She's stuck in the middle, hence the name of the book. How she does it is her tale. It goes quick. I would say this is a woman's book primarily, but I read it anyway. It's a nice story--read it if you get around to it. I loved this story of life and strength, family and love. The Middle Place helped me to appreciate even more deeply the spirit of a young woman - Kelly Corrigan - who, like my beloved daughter, had to surrender to her baldness and her new identity post diagnosis. This kind of "put your feet down on the floor every morning" living takes enormous courage and humor. It all comes through in this memoir. It also takes sheer guts to write about a journey that is both scary and unpredictable while making oneself vulnerable in the process. It's also the truth that sets the spirit free. Kelly Corrigan loves her enthusiastic and attentive father. I loved mine for similar reasons. Daughters who are this cherished by their dads survive things. Kelly also had to beat her cancer while her own father battled his. Watching it outside; experiencing it inside, all this while raising her precious children. Speaking of which, every mother will adore reading about the tender moments of mom and child, those quiet, gorgeous times that we sigh, "I love being a mom"! I think of Kelly's mom and siblings here with seeing two people they loved going through treatments at the same time. What faith this family must have. I enjoyed meeting Kelly's husband on the page. A spouse who is our port in the storm - when the waves are rocking and rolling the boat - is a blessing from heaven above. There is a refreshing authenticity in The Middle Place because Kelly Corrigan rips the face right off pretension with her humor and story-telling ability so I say high five on this book. I say bravo to this young and very gifted writer. The bookseller at Borders highly recommended this book and I had been eying it for some time when I decided to go ahead and buy it. I wasn't sure what to expect. It is a fast read ... read this book in three days. It is funny. It is heart-warming especially when she talks about her dad. It is sad in spots and basically an endearing book. She is a very blessed woman being forced to grow up. Corrigan discovered a lump in her breast and after tests, found out it was cancer. Shortly after she started treatment for it, her father was discovered to have cancer also. Rallying back and forth between her childhood/young adulthood memories, she would talk about her love for her father and her mother. In between treatments, she would share conversations among friends and family ... it is a very light-hearted read about something so scary and what possibly could be fatal. She shares her hardest moments when she lost the last of her eyelashes due to chemo. She shares her joy of getting married and having children and throughout the entire book, one gets the sense that she is slightly spoiled, but oh so loved by everyone, her husband, her children, her parents and brothers and friends. This book touches lightly on cancer and how scared she must have felt. This book is more of a gratitude, "count your blessings" type of book, and definitely not a book about "woe is me, I have cancer." There is humor throughout this book and love. It is just a delightful book to read. If you know someone who has cancer or had fought it and survived, this book might be a good read for them. Corrigan and her father survived the treatments and their love for one another is stronger than it was before. It is a time where Corrigan realizes that she is no longer a child and she has to be strong for her children's sake, and perhaps learn to love and let go. Even while letting go, she has never stopped the love. It is a thoughtful and optimistic book about a cancer survivor.